Every year the International Energy Agency reviews the energy sectors of five OECD countries. The second report for Canada, Energy Policies of IEA Countries Canada 2015 Review, was recently published, drawing on data up to 2013. Overall, the IEA’s analysis provides a valuable summary of the history, context, opportunities and challenges around energy production and use in Canada, including the impacts of changing global oil prices. The graphic below displays some highlights from the IEA report. The Canadian population, as a whole, is too humble about our accomplishments in energy, but the data makes clear that Canada is a major global player in energy. We produce 172% more energy than required to meet domestic needs and export the rest to help satisfy the ever increasing global demand for energy products. Energy, in all of its forms, has a strong influence on Canada’s economic performance, contributing about 10% to GDP and making up around a quarter of the country’s merchandise exports in 2013. Energy will continue to be a big economic driver for Canada in the future. Yet no country is without its energy challenges. In Canada, arguably more so than in our peers, we struggle with social acceptance of new energy infrastructure. Our geography, cold climate, industrial structure (e.g., energy-intensive extractive and processing industries,) and small population relative to geographic size combine to make Canada one of the most energy intensive economies among all IEA member countries. As a result, greenhouse gas emissions have continued to rise, despite steady improvements in energy efficiency, the adoption of carbon pricing in some areas of the country, and other measures embodied in federal, provincial and local government climate change management plans. Comparatively, Canada has strong environmental regulations. For the most part, we have developed our energy resources responsibly – despite ceaseless criticism from environmental groups. A wholesale change in the way Canadians live and do business is neither feasible nor necessary. The IEA suggests a careful and largely incremental re-calibration of existing regulatory regimes to enhance the Canadian brand, improve environmental performance, and help open new markets for our energy products, technologies and services. In trade terms, greater market integration and increased cross-jurisdictional cooperation are important. 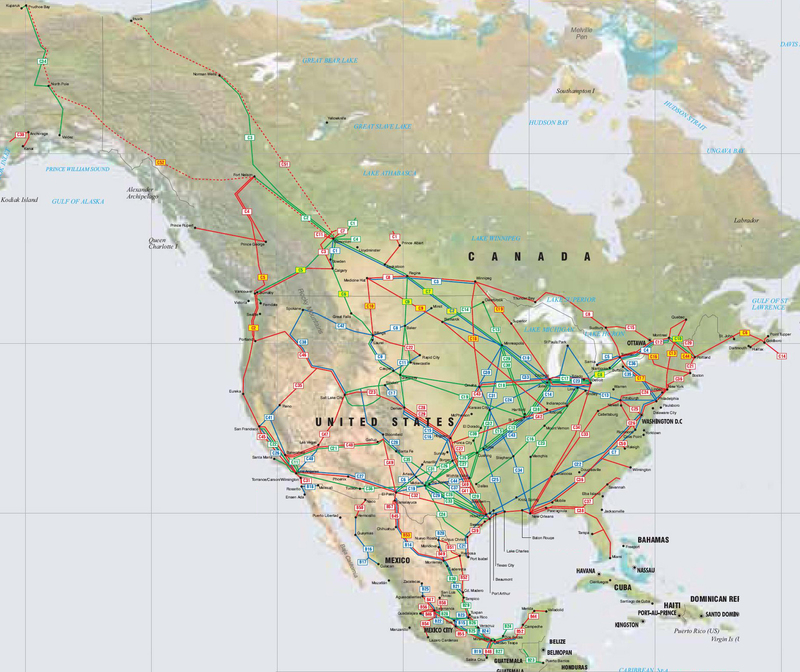 Arguably, this is already well developed, thanks to extensive north-south electric transmission interconnections and a vast network of North American natural gas and oil pipelines (see map). The resilience of Canada’s energy system now depends on strengthening intra-Canadian electric transmission linkages and increasing the capacity for oil and gas shipments, while at the same time positioning Canada to participate in a more robust evolving North American energy market. The IEA correctly points to the need for more collaboration within Canada on climate-related actions. Progress on this complex issue requires working together by strengthening market linkages, pooling resources to step up the pace of energy-related research, and common approaches to regulation. In some ways Canada is a leader in energy – for example, 75+% of our electricity comes from carbon-free sources, and we have a huge endowment of natural gas, the least carbon intensive fossil fuel. In the near term, Canada is well placed to support the further “decarbonisation” of electricity in North America and should not shy away from playing a prominent role in helping to achieve this goal.